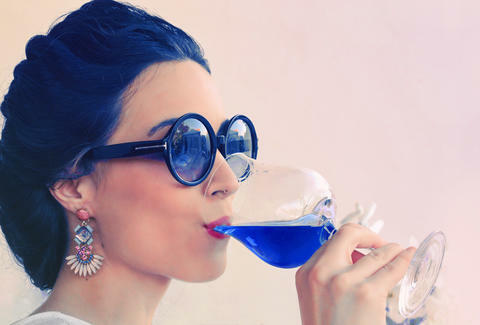 If you're not a white wine person, or a red wine person, maybe you're a blue wine person. Never heard of blue wine? Well, that's because it wasn't a thing until now. But it's definitely a thing now. Yes, Spanish entrepreneurial winemaker Gik has created an electric blue, sweet wine to be served slightly chilled. You probably also want to serve it in a glass that best displays that ridiculous hue. But color aside, it actually looks like a decently priced, quality product. The wine's the result of two years of research conducted in a collaboration between Gik, University of the Basque Country, and Food Tech. Grapes come from vineyards in La Rioja, Zaragoza, León, and Castilla-La Mancha, Spain, which all sound fancy. Best part: A 750ml bottle will only set you back 10 euros, or about $11 USD. Of course, you ask, what makes it blue? The color comes from mixing red and white grapes with the organic pigments of indigo and anthocyanin, the latter of which comes from grape skins. As Eater reports, Gik did a soft launch in 2015 within Spain, selling the product on its website. However, the company is looking to expand sales to France, the United Kingdom, the Netherlands, and Germany in the coming months. And good news for those in the USA: Eater also reports the company is "eying the US" as a possible market after it gets things set in Europe. Because clearly Americans need red, white, and blue wines in their lives. And what's more patriotic than that? Kara King is a News Writer at Thrillist and only drinks two-dollar wine. Send news tips to news@thrillist.com and follow her at @karatillie.